Discount Carpet Cleaning Fort Wayne, IN | Too Good to Be True? After all, who doesn’t want to save money when possible? There are forms of cheap carpet cleaning available for interested homeowners. There are carpet cleaning machines for rent at local hardware stores in Fort Wayne. There are also companies that will do the job very cheaply. The problem with discount carpet cleaning is that you get what you pay for. Low prices often mean low-quality in terms of service and results. You might save some money by renting a machine but the machines for rent are not as powerful as the ones that professionals use. You also are responsible for the labor involved and you run the risk of damaging carpet if you use incorrect solutions or chemicals or an improper amount. The one-man operations that provide carpet cleaning in Fort Wayne also use equipment that is not as powerful as larger companies in the area. Their prices are too low to afford or invest in higher quality equipment, solutions and training. Your carpet isn’t cheap. New carpet is very expensive to purchase and install and you want your carpet to last as long as possible. That means it is smart to invest in caring for it properly and hiring Fort Wayne carpet cleaners certified and trained in the latest and best methods for success. Chem-Dry of Fort Wayne offers green cleaning services and products and superior results you want find from discount carpet cleaning. 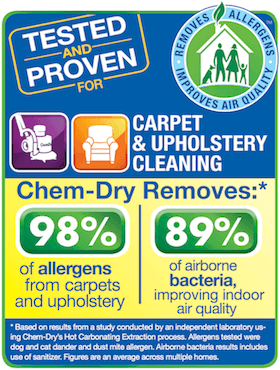 We don’t use soap or chemicals so our results are healthier than other carpet cleaning companies. We use the finest equipment and our process has received The Carpet & Rug Institute Seal of Approval. We even offer carpet cleaning deals online at our website to help with the costs of our service. To schedule an appointment with us, call (260) 409-1138 today!